This appetizer is easy and light. It’s a refreshing cool treat in the summer and a welcome change from heavy fare in winter. Unskewered and tossed together, it makes a gorgeous, simple salad. Marinate the cheese in advance. It will keep for a week or more. Assemble just as many as you plan to eat, as the tomatoes will get gross and mushy if stored in the refrigerator. Several hours or up to a week in advance, marinate the cheese. Halve or quarter the drained boconccini. The size should correspond to the tomatoes, so if you can get grape tomatoes instead of just cherry, you’ll want smaller pieces of cheese. Marinate in vinaigrette, plus a splash of additional olive oil and red wine vinegar and salt and pepper to taste. Only assemble what you plan to eat at one sitting. 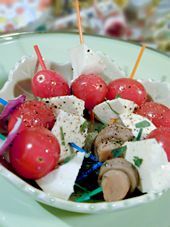 Skewer a tomato, a chunk of cheese on each toothpick. Add a veggie (small olives, marinated mushrooms, or a chunk of cut-up artichoke bottoms) if you like. Garnish with chopped herbs, a drizzle of olive oil, and salt and pepper. This entry was posted on Thursday, September 6th, 2007 at 3:23 am	and is filed under Appetizers, Master Recipe Index, Party Food & Snacks, Vegetables, Vegetarian. You can follow any responses to this entry through the RSS 2.0 feed. You can leave a response, or trackback from your own site.